This quarter we focus on yet another very common specimen that we receive in the lab for histopathological examination; the endometrium. The female reproductive system. Click image for source. In the female reproductive system, the uterus comprises of three layers, and the endometrium is the innermost mucosal layer. The central layer is a thick muscular layer called the myometrium and the outermost layer is a thin slither coating called the serosa (see diagram). Endometrial samples are received in the lab as either pipelle samples, curettings, or as part of a larger resection of the entire uterus; a procedure called a hysterectomy. Indications for endometrial biopsies include heavy or irregular menstrual bleeding, suspected endometrial cancer, subfertility, and for surveillance of women who are at higher risk of endometrial hyperplasia or cancer, e.g. women with polycystic ovary syndrome. Hormone levels and the cycle of endometrial lining. FSH = Follicle Stimulating Hormone. LH = Luteinising Hormone. Click image for source. The menstrual phase, which lasts approximately 4-5 days is the initial phase of the menstrual cycle. This is when the endometrium is shed and the “period” happens. The reason this occurs is because, just beforehand, in the absence of pregnancy, luteinising hormone levels have dropped and the subsequent decline of progestrone and oestradiol levels induce the ischaemic phase. Usually lasting for just one day, this phase includes a reduction of normal blood supply to the functional layer of the endometrium, which causes ischaemia and necrosis. It is this tissue that then sloughs off. From around day 5, the menstrual cycle enters the proliferative stage. During this phase, which lasts approximately 9 days, the endometrium becomes thicker as a result of the stimulatory effect of the oestradiol that is produced by maturing ovarian follicles. The histology of the endometrium shows minimal gland-like structures, but any that are present are very short, straight and narrow. The surrounding stromal cells in the lamina propria are also quite compact. Low power H&E of endometrium in the proliferative stage. Click image for source. As the proliferative phase progresses, both the epithelium and stromal cells become increasingly mitotically active, the glands become longer and the lamina propria becomes more and more oedematous. At the late proliferative stage, the glands are rapidly growing and become tortuous. At the same time, at around day 14, a surge in oestradiol causes a surge in luteinising hormone, which triggers ovulation, and the endometrium now enters the secretory phase. The secretory phase lasts approximately 13 days and, during this time, the endometrium is now preparing for the implantation of an embryo. The glands start to appear like deflated balloons or “saw-toothed”, the glandular epithelium become vacuolated as they begin to accumulate glycogen, and the lumen becomes filled with glycogen/glycoprotein secretions. The surrounding blood vessels become larger, and the lamina propria becomes even more oedematous. Low power H&E of endometrium in the secretory phase. Inset Copyright © Della Thomas. Click image for main image source. Signs of decidual change appear towards the late stages of the secretory phase as the stromal cells become mitotically active. Then, if implantation doesn’t occur, the endometrium enters the ischaemic phase, as described previously, and the entire cycle begins again. 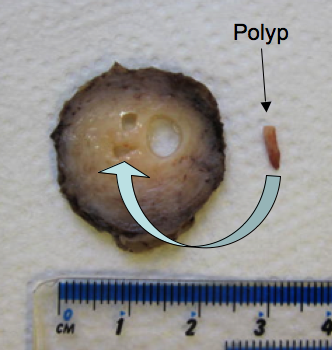 A tiny polyp is removed from the endocervical canal (arrow) in a specimen I dissected. A common pathology associated with endometrium is an endometrial polyp. This is a mass that protrudes from the endometrial lining and is occasionally the cause of irregular menstrual bleeding. Most often than not, however, they are asymptomatic. Endometrial polyps can occur in a wide range of sizes. I recently dissected a uterus that contained a very tiny endometrial polyp lodged within the endocervical canal (see photo). Microscopically, endometrial polyps look almost identical to fragments of endometrium that we have seen above. When they are removed as part of a curettage procedure, they are often not easily identified macroscopically and so may only be firstly identified microscopically. A low power H&E of a fragment of endometrium. Arrows show breaks in surface epithelium. Click image for source. The exact cause of endometrial polyps is unknown. What is known, however, is that they do respond to oestrogen in a similar way to the endometrial lining, which results in their enlargement when circulating oestrogen levels increase. For this reason, small polyps have been known to resolve themselves and no treatment is required. Persistent endometrial polyps can be removed by a simple curettage or minor surgery. One of the most gruelling pathologies involving endometrium is a (mostly) benign condition called endometriosis. This is diagnosed when endometrium is identified outside of the uterine cavity. Just as the endometrium within the uterus is influenced by hormones, so is the endometrium found outside the uterus. What this means is that each time hormonal changes occur during the menstrual cycle, not only do these hormones trigger the uterine lining to become thicker and then shed, they also influence the stray (ectopic) endometrial fragments that have become attached to other areas of the body, to do the same. So yes, it literally is like having monthly periods in areas of the body that aren’t built to accommodate them. 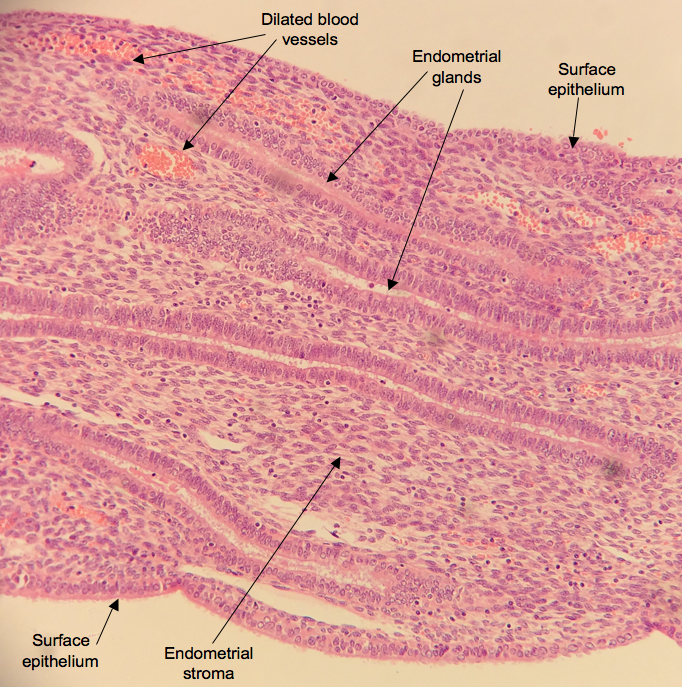 A cross-section of the female body: the red dots show areas of reported ectopic endometrial adhesions. Click image for source. The most common sites for these ectopic endometrial growths are the fallopian tubes and ovaries, but they can also be found in various other areas of the pelvic and even abdominal cavity (see cross-section diagram of female body). Ectopic endometrial adhesions (arrows). Click image for source. A laparoscopic examination can often identify ectopic endometrial adhesions macroscopically (see photo). When these adhesions mimic endometrium, this can be felt as excruciating period pains. Symptoms may start as early as the first period but they are often ignored because heavy painful periods are also common at this stage. If they do continue or severity of painful periods increase, it is important to seek medical advice. A low power H&E showing endometriosis in the duodenum. Click image for source. As you can see, we have the normal structural layers of the duodenum; the luminal villi, the muscularis mucosae, the submucosa and the muscularis externa, and within the muscularis externa there are some glandular structures surrounded by stroma. These structures do not belong here and they are in fact endometrial glands and stroma invading the tissue. The exact cause of endometriosis and how it ends up outside the uterus is debated, but again, what is known is that the endometrial tissue can be influenced by hormones in the same way as the normal lining of the uterus. Another fact about endometriosis is that the ectopic endometrial tissue is completely independent from the uterine lining, exampled by case reports of endometrial malignancies within ectopic endometrial tissue while the uterine lining had remained completely uninvolved and normal. If you would like any further information about endometriosis, please see Endometriosis UK. All images are Copyright © 2015 Della Thomas unless otherwise stated.